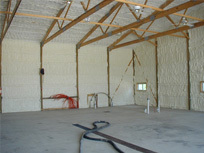 + We offer spray foam insulation for residential and commercial clients in southeast Wisconsin. Our licensed and insured spray foam contractors are the most experienced in the area. Thermal Comfort is accredited by the Better Business Bureau, a member of the Metropolitan Builders Association, an Icynene®Licensed dealer and a proud partner with Home Performance with Energy Star®. At Thermal Comfort, Inc., we install a complete line of Icynene® Spray Foam Insulation products to meet the demands of our customers. All Icynene® products employ 100% water blown technology, resulting in no loss of R-value over time and no long term offgassing effects. Approximately 30%-40% of a home’s monthly energy bill can be directly attributed to air leakage. Icynene® completely seals the building envelope to stop this air leakage from occurring, while at the same time providing excellent thermal resistance. In fact, Icynene®can provide energy savings of up to 50% versus other types of insulation materials. Please contact our insulation business at: (414) 358-1255 for more information on our services or to request a quote.